1. 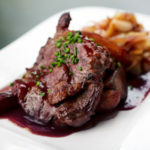 In a saucepan combine demi-glace, Black Currant puree, and wine; bring mixture to boiling. Reduce heat; simmer about 10 minutes, stirring frequently, until mixture is reduced by half. 2. Whisk in Creme de Cassis and heavy cream; simmer mixture 5 minutes more. Strain; transfer to a bain marie to hold for service. In place of the Black Currant puree, try this sauce prepared with The Perfect Purée Red Raspberry or Blackberry.